Twice, in the last few months, film makers have reached out to me to share their movies and to see if I’d like to share them with my readers. In both cases, it was unsolicited and in both cases it was a very pleasant surprise. We’ve already talked about the excellent micro-noir, Burn, and now, it’s the turn of Emily Stewart of Minute MBA. She sent me a link to her short video about the economic impact of the Lord of the Rings series. 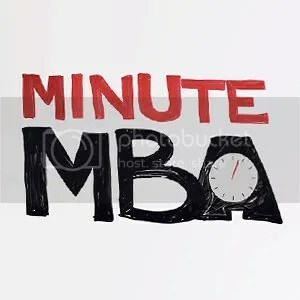 Tell us a little about Minute MBA? The Minute MBA series, sponsored by OnlineMBA, focuses on anything business or money related. As far as the video team goes, the team itself consists of a small group of 5 rather, unique individuals who share a vision of using videos to tell a story/lesson. What led you and your team to make a One Minute MBA video? We were inspired to create a series that enhanced interesting business knowledge through a visual experience. You can learn more about our team via our Vimeo section. What led you to look at the Lord of the Rings trilogy? As avid fans of the LOTR trilogy, we thought it would be really interesting to look at the franchise from a business perspective. There’s some incredible numbers thrown around in there, especially as you openly admit you’re being a little conservative. What’s the bracket for the total sales of the books? For book sales, LOTR is listed at 150,000,000 (http://publishingperspectives.com/2010/09/top-25-bestselling-books-of-all-time/). But note, The Hobbit is estimated at over 100,000,000 by itself and we aren’t counting used books. What do you think has led to the LOTR movies being so successful? As far as the success behind the LOTR movies, I think it all started with Peter Jackson’s ability to understand how to translate these books and adapt them as movies. In other words, while he managed to stay faithful to the original novels, his priority was making sure the story translated well as a film (as opposed to just trying to stay absolutely true to the books). Beyond that, once you combine popularity of the series, and the high production value, it made for a wonderful adaptation that both long-time fans and new audiences could enjoy. Have you seen The Hobbit yet? If so what did you think? While I think it captured a lot of the playfulness and light-heartedness of the original books, I was curious as to why they chose to make it a three-part film series. Not sure if I’m completely on board with that idea as I fear it might unnecessarily cause it to be drawn out longer than it should be (as a film, at least). However, all in all I was content with the first movie – I was particularly amazed at Gollum’s facial expressions in this one and the overall advancement of CG tech since the LOTR films. Who’s doing the drawing? How many takes did it take? The drawings in our video were done by the talented Rosie Heffernan, and it took us about 3-5 takes to film the entire thing! What’s been the video you’re proudest of to date? What’s next for Minute MBA? As for what’s next, we eventually want to be able to take all sorts of data and strive to become a trusted source that not only speaks on business related topics, but on real things that people care about and can relate to in some way. We’re not completely there yet, but we’d like to think we’re moving in that direction. Thanks, not only for the interview, Emily, but for sharing the video with me. This is the sort of thing I love. Short films focus creativity, force you to adapt and over come obstacles and it’s fascinating and, actually, really life affirming to see. Each of the film makers I’ve talked to so far works on shoestring budgets and does incredible work, and it’s an honor to be able to talk to them. So here it is: I’m a good critic, a good interviewer and I have at least some audience here thanks to Pseudopod if nothing else. If you are a short, or long-form filmmaker, get in contact with me at either alasdairstuart@gmail.com or @AlasdairStuart on Twitter. I can’t promise to like everything I’m sent but I can promise to give you exactly the same sort of chance to talk about your work Emily, and Jamie at Redshirt, Miles at MilesTone and Jerry have all had. So get in touch. Show me your movie. See what happens.